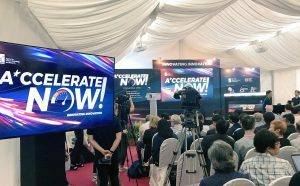 Singapore, November 2018 – X-ZELL Inc. has been one of eight promising biotechnology start-ups selected to exhibit at the inaugural A*CCELERATE NOW exhibition in Singapore. The landmark event – held in a move to celebrate the re-branding of ETPL, the commercialisation arm of the Singaporean Government’s Agency for Science, Technology and Research (A*STAR), into A*ccelerate – attracted more than 2,000 visitors from across Asia, including some of the biggest names in the biotechnology and pharmaceuticals space. Focusing on the detection of ultra-rare cells in small blood and tissue samples, X-ZELL was part of the ‘Productize Now’ showcase highlighting young companies in the process of transitioning from research and development to product commercialisation. The company used the opportunity to present both the world-unique platform technology that recently allowed it to detect some of the most elusive cells in the history of cancer cell pathology, as well as the first medical assay developed on the back of it – a blood-based test for the early detection of clinically significant prostate cancer, aptly named X-ZELL Prostate™. “It’s a true privilege being chosen to exhibit at such an iconic event and witnessing the historic rebranding of ETPL into A*ccelerate,” commented X-ZELL COO, Johannes Hille – adding that the Singaporean biotech community swiftly embraced the rare cell detection specialist, which originated in Bangkok, Thailand and only recently announced it would move to Singapore in 2019.